I need to get back to sewing, seriously. I really miss it and as I have fabric for a quilt that I want to make for the two of us, I thought I would get back into the sewing swing of things by doing small projects. 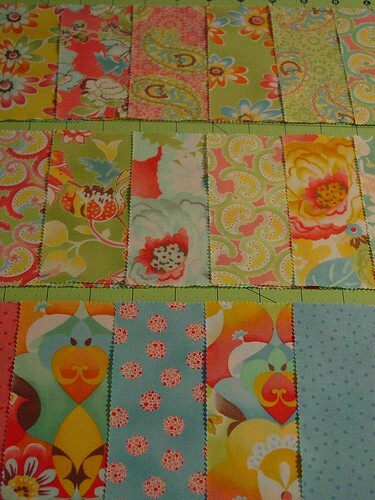 Then my goal is to have our quilt done no later than June 1st. Cross your fingers. Sewwwww, in order to fulfill this desire to stitch again, I signed up for two sewing swaps on Swap-bot. Wow, say those last 10 words really fast…you’ll mess up. Well, I did. 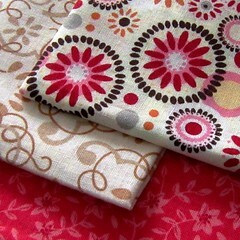 Here are the fabrics I’m using for the mug rug for my swap partner. I liked the combination so much I bought extra so I could make a mug rug out of it for moi. 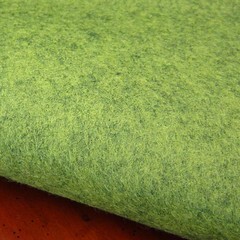 Below is a photo of the felt I bought for the coffee cup cozy. It’s a really interesting shade of green, with what appears to be flecks of black or navy blue in it. It’s 100% wool felt so it should offer protection from fingers when using it. There is a specific pattern that we’re using and the tutorial you’ll find there for it is very nicely done. Sewwwww, that’s all folks. Time to map out time this week for some sewing machine fun! Oh, man would I like to know how to sew. My mother did marvels with her sewing machine… could put a new zipper in jeans in a few minutes and I can’t sew a lick! My son however can — isn’t that amazing, it got passed down and skipped me. That’s awesome your son can sew. I think more males should at least know HOW, right? You never know when the skill will come in handy. That is a lot of pieces to sew for the quilt. Did you get it done by your hoped date?